As a music teacher, I think two of the most challenging standards to teach are composing and improvising, so I was excited when I came up with a way to incorporate them into my blues unit. This unit combines the history of the blues, the music theory behind the blues, and learning to play the ukulele. This year I decided to deepen student learning (I hope) by extending the unit to include composing and improvising. This post will discuss my approach to teaching composing. I’ll address improvising next time. I’ve taught composing before but it’s difficult to make it meaningful for students if they don’t have a way to immediately hear what they are writing. 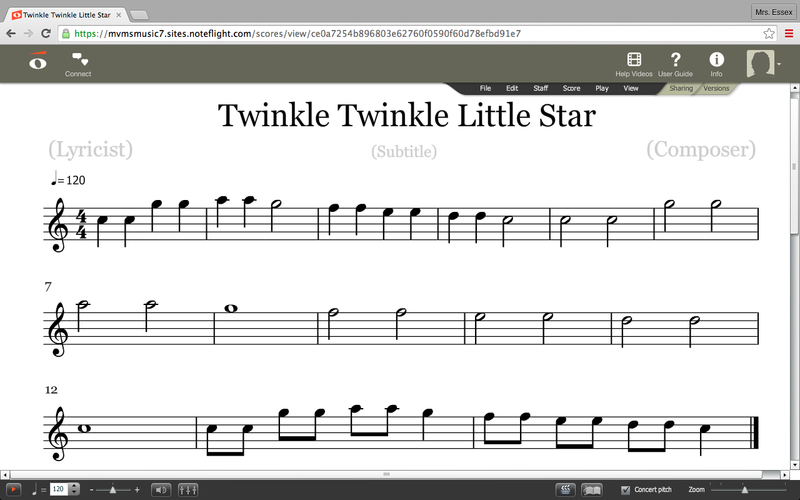 This year I have access to chromebooks and student accounts on Noteflight making it possible for students to hear what they compose every step of the way. They can create, evaluate, edit, and even experiment with changing instruments and tempo. This is a huge plus for general music students – many of whom may not have a firm grasp on note and rhythm reading or the skills to play what they write. What better way to learn what a half note is than to use it consistently in music? Or to learn what a flat does to a pitch than to hear the change when you apply it to a note? So how do you teach kids to compose the blues? First, we started with the 12 bar blues chord progression. This was a natural place to start because my students were learning to play this on their ukuleles. We went from sound (playing the chords) to symbol (writing the chords). Students created a “new score” in Noteflight and copied the 12 bar blues chord progression in C that I provided for them. If you have time, you could also teach students to build a chord on the root provided. I had students repeat the chord progression so that when they were done they had 24 measures. Students were also encouraged to create rhythmic interest by using different note values for the chords (while still filling the whole measure with the correct chord). Next, students created a melody by using the pitches in the blues scale (in C). I provided them with the notes of the scale and told them they could use the pitches in any order and any note value. I reminded them of the AAB form of blues lyrics (learned earlier) and how that could be applied to their blues melody, too. I also mentioned that if they are struggling for their melody to sound like it has a solid beginning and ending, it can be helpful to start and finish on C. After that, it was all up to their creativity. Overall, I was very pleased with their compositions – and so were many of the students. Yes, there were a few who wrote their chord progressions using all whole notes and copied the blues scale in order, in whole notes. But even those kids were able to listen to what they wrote – seeing the notes being played as they heard them. Many kids, however, spent a lot of time editing and finding exactly the sound they wanted. I graded these using a very simple standards-based rubric. If students demonstrated they understood the chord progression and blues scale (those boring but correct whole note compositions), they earned a B. Adding more creativity and decision making earned an A. Mistakes in either the chord progression or blues scale rated a C, while compositions that lacked evidence of understanding the chord progression or scale fell to a D. Only a lack of work received an F. Of course, you can grade this based on your own philosophy and administrative requirements. Finally, here are a couple of students sharing their compositions. 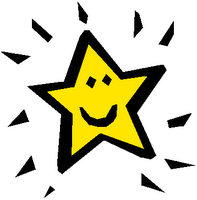 We post these on our class youTube channel so everyone can see what’s going on in our class! This week in Music+STEM we learned what a Theme & Variation is. Then we created one. Like a composer. 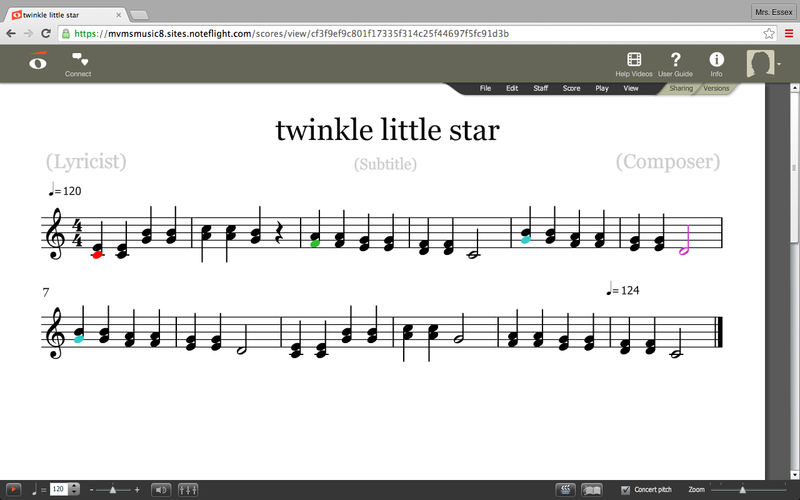 After listening to an example, students logged into Noteflight. 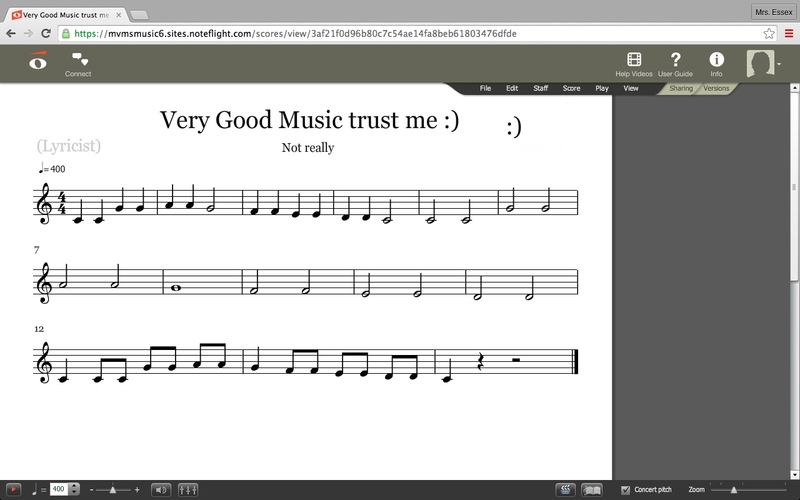 This is great web-based notation software that anyone can use for free. If you get a subscription you can create classes where students log into your “site”. With this feature, the teacher can see all their work. 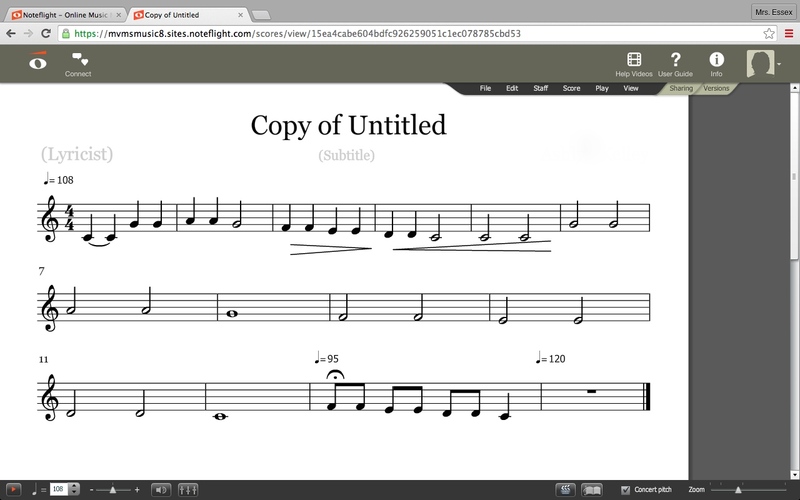 This was the first time my students used Noteflight, so part of this assignment was set up to teach them how to use it. They started by transcribing the first four measures of Twinkle, Twinkle, Little Star. I limited it to the first four measures to keep the task manageable. I walked them through entering the pitches and assigning rhythms as they worked on chromebooks and I projected my screen. Some students caught on very quickly while others needed a bit more guidance. Many students were able to offer help to others – a great way to reinforce their learning. After creating their “theme”, students created two variations. One in which they doubled the value of each note and another where they cut the value of each note in half. Again, this was prescribed so students could learn to use the features of the software. If they completed these tasks, they were able to create their own variation. 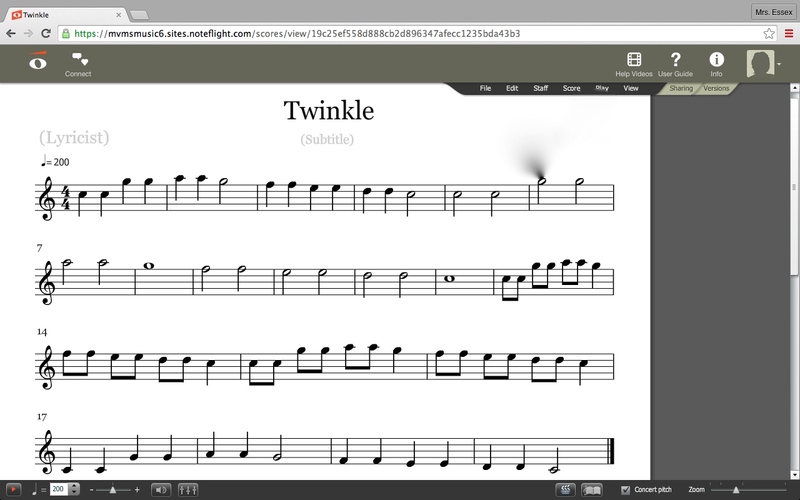 One of the great features of using Noteflight is that students can immediately hear what they are composing. I noticed that several students found mistakes in their notation first by listening, then went back and found the incorrect note. Below you will see that one student even figured out the rest of the song on her own – just by listening to the notes as she entered them. A note to teachers who might think they need to teach students note names and rhythms before using this – some of my students knew these but most did not. Many, however, learned note values (and some pitch names) by the time we were done. What better way to learn the difference between a quarter note, half note, whole note, and eighth notes than by using them and immediately hearing them? As my grad school professor continually preached, create a context and a need to know and students will learn. This is the perfect example of that strategy. I’m excited to continue to use this as a composing tool for students – their work the first time around was impressive! 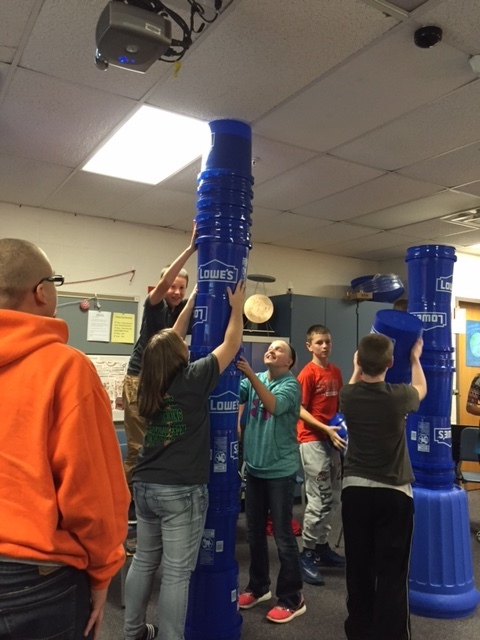 Finally, we finished up the week with some bucket drumming. Students created a variation to a rhythm pattern and we did some fun ensemble playing.